The following is an edit of a post which first appeared in January 2010 on The Blah Blah Blog. At the end of January [we had] an opportunity to spend a few days away photographing Lawrence Lee’s (LSL) stained glass windows. We caught an early ferry and drove up to The Church of St Andrew & St Mary the Virgin at Fletching in Sussex – our first port of call. 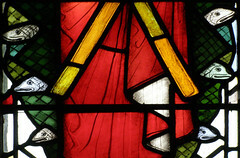 Here we found two tall windows – one of St Andrew and the other of the Madonna and Child. Both were fairly traditional windows made in the early-mid 1970s. 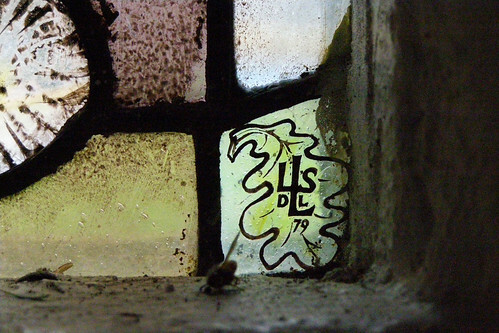 In the same church there was a window by one of LSL’s former assistants – Alan Younger. 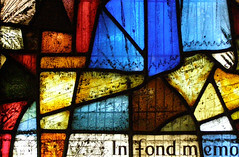 We had seen one of his windows at Ewell on our previous trip and Lee’s influence on Younger’s work is very evident. I preferred this window to the two earlier pieces by LSL. 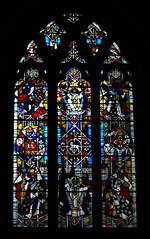 After that we dashed off to St Mary Magdalene at Cowden to see the St Dorothy window. This one was a memorial window for a couple – he a doctor and she a keen gardener. This information came from some notes that Stephen found in the booklet but the medical influence was clear, with a staff and serpent depicted. I was puzzled but delighted by the bat at the top of the design but have no idea what it represented. We may never know. The other striking thing about this window was that within his signature were the initials of Stephen’s mother – also Dorothy. Stephen wasn’t sure if this was because his father had no assistant for that window and that his mother helped, or if it had more to do with the fact that it was a window of St Dorothy. 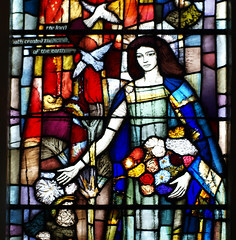 The Du Buisson Memorial window by Lawrence Lee. Even though the light was going we managed to cram in two more windows. We went to Penshurst C of E Primary School quickly to view a small window that had been installed in the 1970s as a memorial – the Du Buissonn Memorial window – and met with the head teacher there. In 1978 the children of the school had raised over £200 to help to pay for the window and had received a letter from Biddy Baxter – who some of you will know was the producer of Blue Peter for many many years. The window was small, almost like a fanlight but over a wide archway – and very difficult to photograph because of the poor light. By now the light was fading fast so we walked back to the car and headed off for Stephen’s brother’s home in Brede. We arrived to a lovely welcome from Caroline and finally I met Lawrence Lee himself – a very fit looking 100 year-old gentleman who stood to greet me when I went in. Soon Stephen’s brother Martin was home from work and his daughter also joined us. We had a lovely relaxing evening chatting and I showed Lawrence a slideshow of the windows I had photographed on our previous ‘mission’ back in September. He made so many windows it would be impossible to remember all of them but he did recall a few details and some particular windows, asking me to pause a few as we went along. He also chatted about his favourite windows – the Ruth at Tunbridge Wells and his Penshurst window. If you would like to see more photographs of Lawrence Lee’s work, please visit the Lawrence Lee Flickr Group. This entry was posted in On the Window Trail and tagged Alan Younger, Biddy Baxter, Blue Peter, Cowden, fletching, Kent, Lawrence Lee, Lawrence Lee Project, Lawrence Stanley Lee, penshurst, stained glass, stained glass windows, surrey, Tunbridge Wells. Bookmark the permalink.